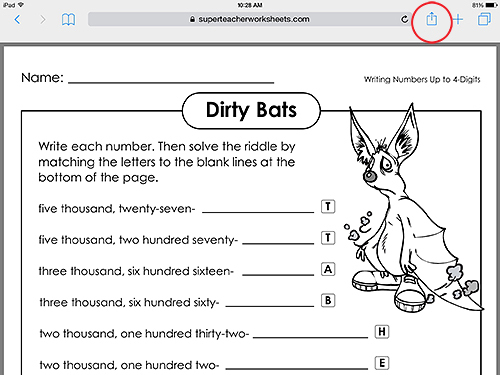 Did you know that you can print our PDF files from your iPad or other Apple mobile device? You can! Here is a helpful guide for printing PDF files from an iPad. 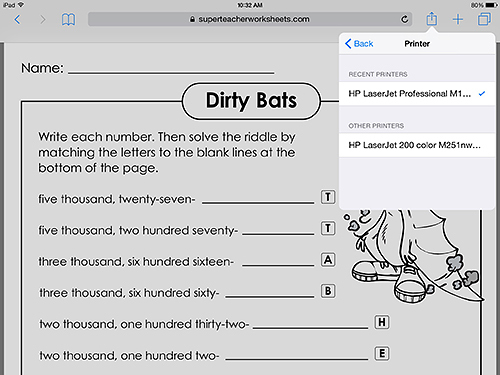 We hope this simple instructional guide will be useful to you as you take advantage of all the great printable resources Super Teacher Worksheets has to offer. 1. Open the PDF file you would like to print. 2. Locate the share icon on the top right corner of your screen, and click it to access the print icon. 3. A small box with several share options (including Message, Mail, Twitter, and Facebook) will appear. At the bottom of the box, you will need to swipe your finger across the gray icons until you see the Print icon. 5. If you do not see any printers listed in the Printer Options box, you must make sure the printer you would like to use is compatible with your iPad. If the printer is wireless, you can use the following link from the Apple support team to identify your printer on the list of compatible printers here. 6. If your printer is not on the list of compatible wireless printers, then you will not be able to print from it using your iPad. (If this is the case, you can always save the file to your filing cabinet to print from your desktop later!) However, if your printer is compatible with an iPad, make sure they are both connected properly to the wireless network you are using. Also, make sure they are within wireless range. If you still have trouble, you can refer to the above link for other helpful suggestions. 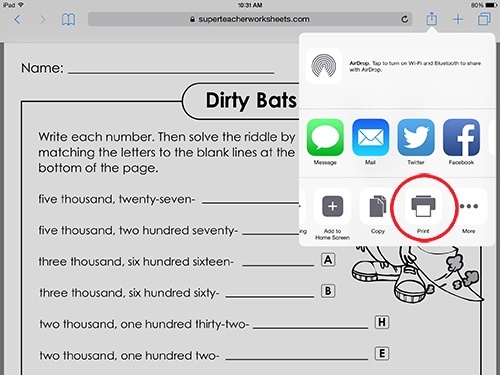 The Super Teacher Worksheets staff knows our customers are busy, fast-paced, and on-the-go educators. That's why we want to assist you however we can in accessing our printable resources with your mobile Apple device. We admire you for using the latest technology - keep up the great work, Super Teachers!